Because we had to cancel a couple shoots this year due to some bad weather at the planned locations we decided to hit the road in my home state of California to visit and fish with some friends and teammates at the northern end of the state. 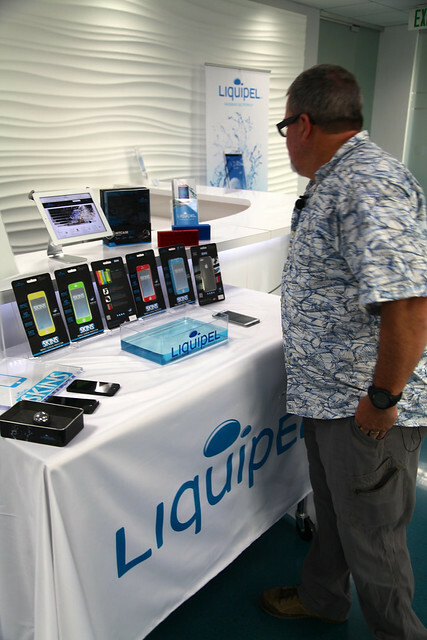 On the first day of the trip we stopped at Liquipel to get an introduction to their product and get some of our gear treated. For those of you that have not heard of Liquipel it is a micro coating that can be used on many items including electronics to protect it from water. Here is a little sample video from their site. Not only do they have this coating but also have skins to protect your phone screen from damage. We dropped a large ball bearing on the screen of a phone and had no damage. I see this a perhaps a great addition to a fish finder screen. They even had a treatment for fabric that has huge potential to us paddlers. After our tour of Liquipel it was back on the road for a quick stop in Santa Barbara to visit an old friend for lunch then the long haul up to Shasta Lake. All told we had a 17 hour day to get to our most northern location for the trip. Thanks goodness for truck stop coffee, Dukes beef jerky and Bigs sunflower seeds. 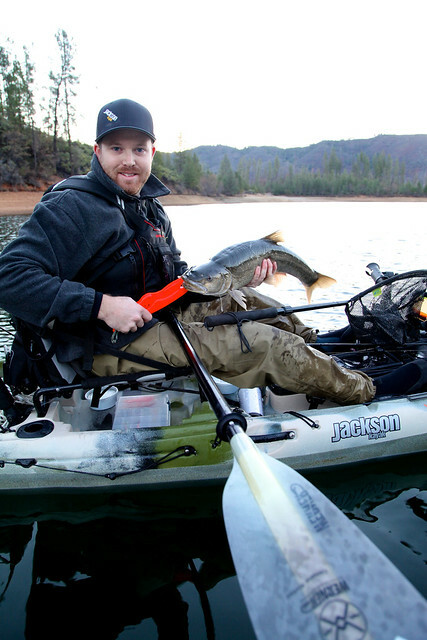 At Shasta Lake we were hosted by my Jackson Kayak fishing teammate Jeff Baker. 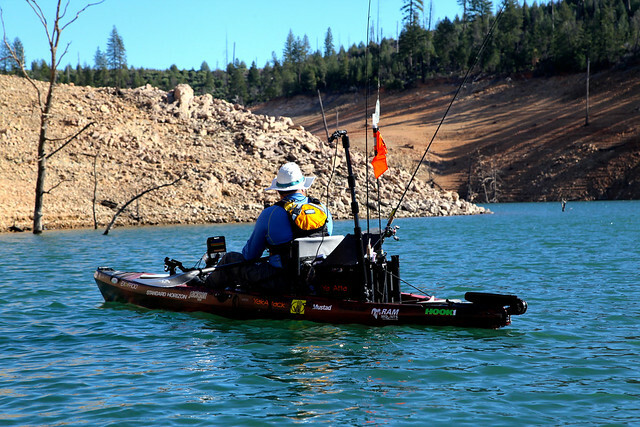 Our initial plan was to spend a day drifting and fishing the Sacramento river and half a day fishing Lake Shasta but as always plans are subject to change. Our normal issue on trips is we tend to get followed by rain, but not on this trip. Just so happens we decided to go fishing during the worst drought California has seen in years. Because of this there simply was not enough water to drift the river, so we spent our first day on Lake Shasta. Now Shasta does have pretty big fluctuations in water level anyway but as you can see in the picture below it was beyond low on our visit. We set up to troll for trout and had a second rod for tossing lures for bass. The trolling set up was a dodger above a small hoochie which gave off a really good flash and action at paddling speed. The wind came up pretty early so we ducked into cover when we could tossing lures hoping for bass in the frigid 46 degree water. I decided to throw a small Sebile magic swimmer soft as I could fish it weedless around the heavy structure. Well of course while fishing for bass I manage to catch a trout on the magic swimmer. These lures will catch anything. That trout was the only fish we managed to catch that day as the wind really came up hard and pushed us off the water. I didn’t even get a photo of the fish because the slimy bugger slipped out of my hands before we got the camera out. Lake Shasta is a man made lake so there are a lot of submerged trees and even a submerged town in the lake. With my Raymarine Dragonfly fishfinder I was able to get some screen grabs that really show off the structure. It was pretty amazing the detail I got from this unit. Split screen view of my Dragonfly fishfinder. 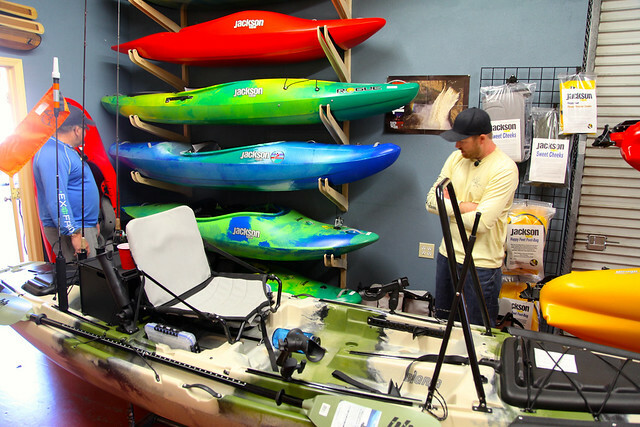 Because we were off the water fairly early we decided to stop by Headwaters, the kayak shop that Jeff works at to get a look at their line of Jackson kayaks as well as a closer look at the new Jackson Big Rig. 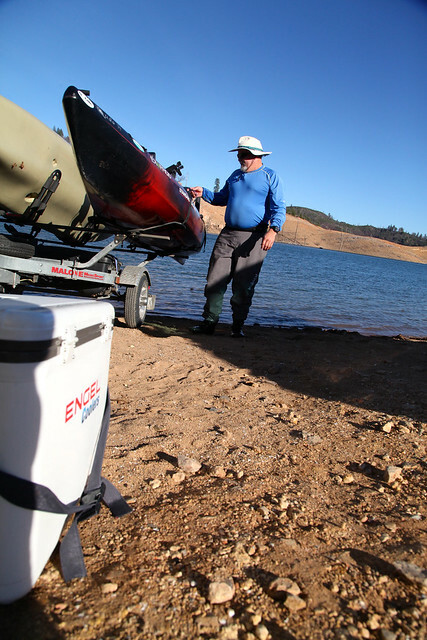 The next day we hit up another lake in the Shasta Lake area and had much better luck, as least as far as the wind and weather goes. We tried the same routine trolling for trout and casting for bass but this day I had no luck at all while Jeff landed several trout and a Pikeminnow, which I had never seen before. After about five hours on the water we loaded up the truck and headed to Clearlake to fish with my friends Sean White and Terry Gowan, but I will save that story for the next installment. Huge thanks to Jeff, his wife and their lovely daughter for hosting us and for letting us crash at their house. I hope I can return the favor if the come to San Diego. Those pikeminnow are an invasive species, and eat all the young spawning fish in the lakes and rivers…nasty fish that should be tossed on the shore. I’ve cough more Damn ‘squawfish’ out of the Russian River than all other fish combined! On a positive note, I do love your show!